The demolition of a building through a controlled explosion usually brings together hundreds of people willing to become witnesses of a scene that is often spectacular. Internet platforms like YouTube are filled with videos that give proof of this. On December 26, everything was ready for the demolition of a ten-floors edifice illegally built in Sebastopol, capital of Crimea, Ukrainian region annexed by Russia last spring. The property was illegally built and justice sentenced that it should be demolished. However, as shown in a video published in the blog ‘WeirdRussia‘ nothing went as it was planned. The building, which must have reached 16 floors, had been designed to withstand strong magnitude earthquakes. This circumstance, which apparently was not taken into account by those responsible for the demolition, caused that after the first explosion the building only recorded a shake and stayed inclined to one side. 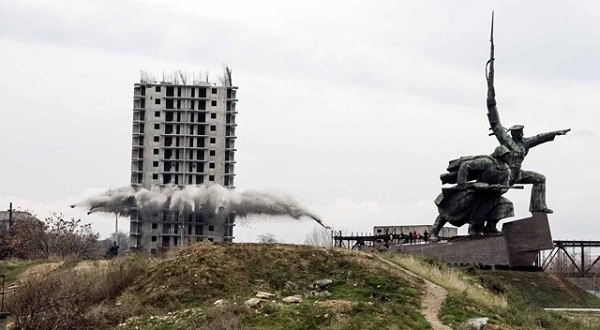 This unusual spectacle provoked laughter from the dozens of people who had gathered to witness the demolition. However, as the British newspaper ‘The Mirror’ notes, some citzens refused to accept this failure and argued that they had used a smaller amount than it was required to produce less dust and debris and therefore to prevent explosions that could damage adjacent buildings. Several hours later, the workers returned to blow up the building but against all odds, and to their amazement, when the dust cloud dissipated the building was still standing . In the end, they had to wait until Saturday for a third explosion to finally overthrow this tower that refused to be demolished. According to the ‘RT’ site, to blow up the building it was necessary to use more than 400 kilograms of explosives, while transaction costs increased to five million rubles -more than 80,000 euros- which will have to be borne by the municipal coffers.